Hello, I'm James G. Wall, a filmmaker from Leeds. 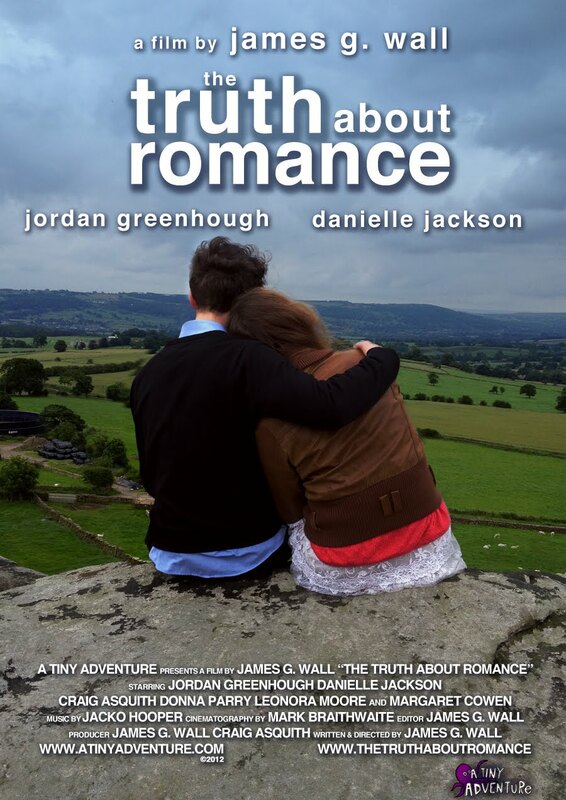 I made the feature film The Truth About Romance, I released it on YouTube and it's gone on to reach over 300,000 views. Feel free to email or comment any questions, I'm happy to have a chat with you. After I graduated I thought I was a big deal! I had a top degree and a really good grad short film (Fish Food). When I originally uploaded it to YouTube and it did the rounds I got great feedback. I thought everybody would want to work with me. I soon found out that wasn't the case, and the advice I was given was to get some experience. I spent a few months looking for experience, but I didn't really find much, I managed to do a couple of days on a feature film, which was great. Other than that there wasn't much experience to gain in Yorkshire. I spent a lot of this time practicing and improving my writing, whilst making contacts and networking. I'd always known I wanted to be a writer/director, but whilst I was studying I took advantage of learning every aspect of filmmaking, I worked on fellow students projects in a variety of roles. I'd also invested much of my student loan on equipment and software. This made making short films much easier when I'd left college. I didn't have to rely on a sound guy, editor etc, I could do it myself. I had all the tools to get out there and start creating. I set myself weekly challenges to see what I was capable of. See if I could write, shoot, edit and upload a short film in one week. My portfolio really started to grow. It also gave me the opportunity to work with local actors. Plus it was a great way to practice my craft, as well as shooting with no budget and limited time. Time has always been my worst nightmare, but whilst making short films I'd developed my own style and techniques of shooting quickly. I'd average a few hundred views per short film on YouTube, although I had a small audience they seemed to really enjoy what I was making. The problem with YouTube is it's massively over saturated, and there's millions of videos being uploaded every day. If I wanted to get noticed I knew I had to do something really special. In the Summer of 2011 I started thinking about the idea of making a feature film. I started making a few notes, story lines, ideas etc, but didn't really think much more about it. However, I'd started telling some of the actors I'd been working with that I wanted to make a feature film and they were up for it, completely onboard with the idea. It was finding the rest of the cast and locations which was challenging. Plus, I was pretty much doing all this on my own. I'm still shocked today that I managed to pull it together. Over the past year or so I'd been building a bit of a profile for myself on social media, so when I was having trouble with a location or casting I could post something on Twitter or Facebook and the support was brilliant. There were people I'd never met in real life offering their homes as a location because they'd enjoyed my short films. Social media was a really big help. Now, because I had no money I knew I couldn't afford a crew, which is probably the most important part of making a film. So, the crew consisted of myself and a friend I graduated with, who'd been helping me make my short films (and he was my housemate at the time). We'd developed a real understanding of how each other worked. I don't think anybody expected I could pull this off, I think most people had thought I'd lost my mind! But I knew I could shoot a 5-10 minute short film in one day, so I kept thinking all I had to do is break the shoot down into 12 short films, and when I thought about it like that it didn't seem too difficult. It was like I'd spent the last year training for this moment. On July 2nd 2012 our 14 day shooting schedule began. Between myself and Mark we did all the crew work, everything! I'd be directing, whilst booming and sound recording, and Mark would setup the camera and be holding a light or reflector. I had another friend that would help (who had no filmmaking experience) with the clapper and script supervising, when he wasn't available an off camera actor would do it (and on one of the days an actors girlfriend helped). 14 days was the most I could get everybody available from work. We all had full-time jobs and we had to use our holiday time. Anything more than 14 days would've been unfair. I also chose to shoot in July because I scripted a lot of exterior scenes, thinking there'd be lots of lovely sunshine... I was wrong, out of the 12 days it rained on 8 of them. That wasn't the only problem with the production. The day before we started shooting a location and an actress pulled out. Luckily one of the actors girlfriend's parent went away on holiday that same day and offered their house to use. The only problem was their house was a big family home, nice furniture, lots of family photos and ornaments, massively different from the location I'd originally chose and scripted. I improvised some new lines to explain why he had such a nice house. In the end it worked out better because I only had the original location for 2 short days, whereas the new location I could use when I needed it. That worked out great when our lead actress got food poisoning and I had to change the shooting schedule. About a week into the shoot another actress pulled out because she got some paid work on Casualty. She had to be replaced and a new actress prepped in less than 24 hours. In between takes I was looking on casting websites and on social media for a replacement. It was very stressful, I thought the entire film was doomed at that point. However, I managed to find somebody and I was very grateful they could do it at such short notice. That's the major issue with not having a budget, you can't pay people for their time, which also means they have no commitment to your project. If something comes up that is going to pay their bills then they will take it. We are all trying to survive the next day in the creative world. As you can imagine I was constantly having to change the shooting schedule. It's great having a plan, and I planned every fine detail, but it also helped to be flexible and to be ready to think on my feet. Other than that the shoot went swimmingly. I mean, I was living the dream! I was making a feature film! I'd wake up every morning in those 14 days absolutely beaming to start the day. And although it was tiring and stressful it was still the best time I'd ever had. Then came post production... I love the post production process, but this took the best part of a year to complete. Again, I was doing this all on my own, everything from logging, editing, sound, foley, colour etc, everything!! It was taking so long to finish because my life was getting in the way. At this point I was working full time, as well as freelancing, and I was trying to finish the film. Eventually I quit my job, relying only on my freelancing work to pay the bills (which brought a new set of problems), but it freed up enough time to finish the film. In late June 2013 I uploaded it to YouTube. Many people ask why I chose YouTube over other platforms, or why I didn't try selling it or go down the festival route. This is mainly a money thing, a) I didn't have the money to submit the film to lots of festivals, I was barely making rent at this point. b) I didn't spend any money making the film (around £250) so I didn't have nothing to lose. All I wanted was to show the world what I could do. By putting it on YouTube I could email the link to who ever I wanted. The reaction still blows my mind, I mean 300,000+ views, it's crazy! When we were shooting the film I asked the actors what their expectations were, and they said if it could reach 12,000 views within a year they'd be really pleased. So to reach over quarter of a million is amazing. I've received so many emails and comments from all around the world, with people saying beautiful things about my film and myself. It's something I've come to love, replying and trying to inspire others to do the same. I enjoy reading your stories, whether they be about a filmmaking journey or a personal love story and how you've connected with my film. It's been a truly amazing experience, and I definitely think the future of independent film is online. I believe in the next few years more and more films will be released like mine and I reckon film festivals will start their own alternative online version. However, at the moment the industry hasn't quite recognised my achievements in the way I wanted. It's definitely opened up a lot of doors, and I've had meetings and phone calls I would never have had without making this film. Film is still very traditional, and I've had industry people say things like, "If only I'd seen your film at a festival." Doing the festival circuit gives you certain credentials. You can say you've been at this and that festival and that will impress people. In a lot of peoples opinion they think anyone can upload a film to the internet but not everyone can get a film shown at a festival. Hopefully this will change as more and more films succeed online like mine. However, for now, nobody as done what I have manage to do. With no money, no backing, no marketing, or anything like that. With just my passion, determination and trust in my own abilities and talent I've managed to get my 90 minute film made and out there and seen by hundreds of thousands. Hopefully my story can inspire you to get out there and make some films too. A TINY ADVENTURE .COM. Powered by Blogger.